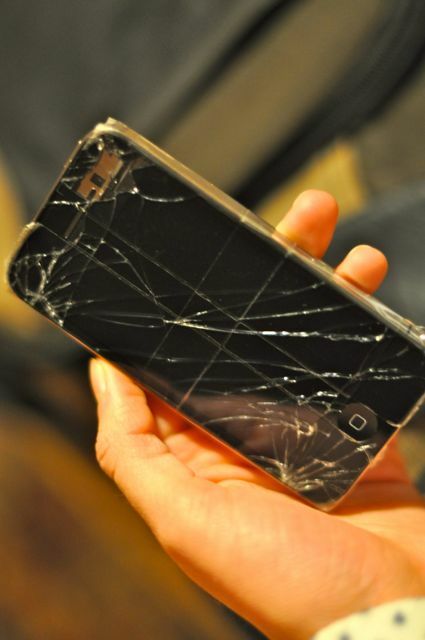 I dropped my phone in the parking lot of the main mall of Maine, the Maine Mall, last Friday. I dropped it right on its gorilla glasshole face. I’ve been using iPhones for close to five years — at this point, I’m embarrassingly dependent on them. How do non-iPhoners check Facebook? Or identify songs they don’t know? Or make their pictures look old? Or sneakily take pictures of people while pretending they’re talking on the phone? I just don’t get it! As you can imagine, I was upset when I picked my phone off the ground and saw how funkdafied its face was. I thought maybe I could save it by searching the ground for the pieces of glass missing from the screen. Turns out tiny glass shards are hard to find in slushy parking lots at nighttime. After giving up that idea, I thought if I went to the Apple store an Apple genius would take pity on me. He’d be charmed by my sweetness, and intimidated by my budding mustache, and would switch out my phone for a new one on the cheap. Either my sweetness wasn’t charming enough or my mustache wasn’t intimidating enough, cause my smelly little genius wasn’t having it. The best he could do was slap a few pieces of packing tape across my screen. Seriously. 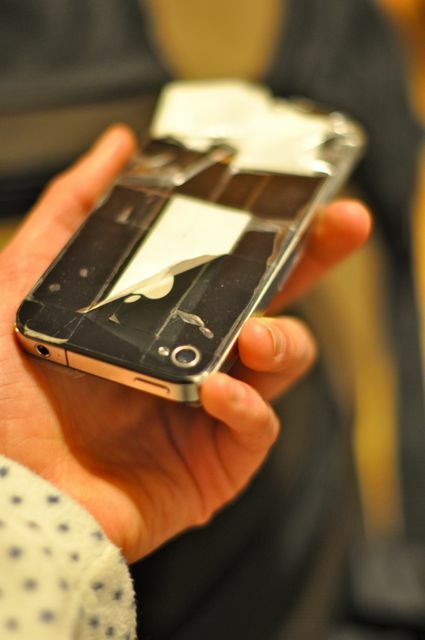 Dude slapped the crap out of my phone with tape. Now, I’m stuck with a cracked phone with tape sticking out all over da place. It still functions, kind of, but I can’t really use it to make phone calls. I’d like to buy a new one, but no way no how am I wasting valuable student loan moolah on this. I bet I can make it until summer. Right? P.S. Quick update on my goal to debt freedom: I paid off Credit Card #1, all but $31.49 of Credit Card #2, and paid back my mom for my new tires. One of my student loans effed me up by switching my minimum payment, so I think one of my payments was late. Dangit dammitall. P.P.S. That new iPad looks sweet, huh? And to think, starting at only $499! This entry was posted in debt lyfe and tagged classy, geniuses are jerks, humor, ipad, iphone, technology on March 7, 2012 by classygallie.